September 20, 2002 - The Kolka Glacier in South Ossetia, Georgia, breaks off and buries the river valley below, killing more than 125 people. stations, and melting of the glacier was calculated. From 1995 to 2002, the summer air temperatures were higher than average, and for the 4 years preceding 2002 glacier melting exceeded the norm by 1.5–2 times. Thus, the firn field located high above the right side of the glacier was included in the runoff. Very intensive melting may have played a role in the formation of the firn and ice falls. Global warming is having a significant affect on glaciers worldwide, with the vast majority of them currently in retreat. As these glaciers vanish, the affects on downstream populations who depend on them for water will be profound. September 26, 2006 - Governor Arnold Schwarzenegger signs California's Global Warming Solutions Act into law. The bill requires California to reduce greenhouse gas emissions levels back to 1990 levels by 2020. This represented approximately a 25% reduction. It was the first statewide bill in the United States to set a limit on greenhouse gases. Governor Schwarzenegger is one of the more outspoken Republican proponents for taking strong action to mitigate climate change. In fact, fighting climate change should not even be a partisan issue, in my opinion. There are so many compelling reasons: economic, security, jobs, morality, biodiversity, etc. that the fight should easily be supported by everyone regardless of political affiliation. 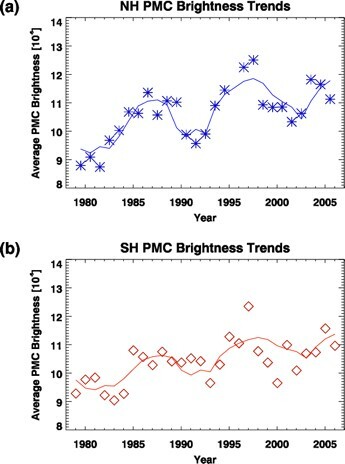 January 29, 2004 - New research from British Antarctic Survey and University of Illinois is reported in Geophysical Research Letters related to polar mesospheric clouds. These clouds have brightened by 15% over the last 20 years, which, through a complex mechanism indicates global warming. 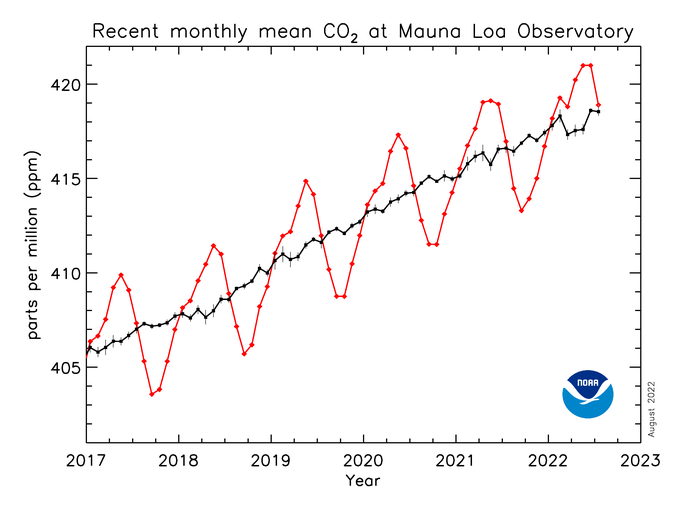 Pat Espy, scientist at the British Antarctic Survey explains: "The growing brightness of polar mesospheric clouds is attributed to increasing levels of atmospheric carbon dioxide and methane, which in the upper atmosphere makes the Earth a more efficient radiator leading to cooler temperatures. By understanding more about how and where these clouds form scientists can use them as a measurement of long-term global climate change." Global warming deniers and delayers will often trot out some "study" or other that counters the strong evidence that our climate is changing. This study is an example of one of the hundreds, if not thousands, of small pieces of evidence that when put together make the case for a changing climate undeniable. October 2003 - The Chicago Climate Exchange begins trading carbon allowances. The Chicago Climate Exchange was the first North American market to trade in greenhouse gases--predating the European trading scheme. These organizations were first in the world to make legally binding commitments to reduce greenhouse gases, in the world’s first multinational, multi-sector market for reducing and trading greenhouse gases. Until only recently, adding greenhouse gases to the atmosphere could be done at no cost. Within the last ten years numerous efforts to put a price on carbon and create markets for carbon have been commenced. The CCX was a ground-breaking organization in this burgeoning and critically important aspect to fighting global climate change. 2002 - Ward Hunt Ice Shelf breaks in two. The Ward Hunt Ice Shelf is the largest ice shelf in the Arctic, attached to Ellesmere Island in Canada In 2003, satellite imagery showed that a crack that had been observed in 2000 had broken the ice shelf in two, draining the largest epishelf lake in the northern hemisphere. In April 2008, it was discovered that the shelf was fractured into dozens of deep, multi-faceted cracks. It seems likely the shelf is disintegrating. The most likely cause is warmer air and sea temperatures, likely a result of global warming. One of the most significant effects of global warming is melting ice. Scientists have been studying glaciers, polar ice fields, continental ice sheets, snow pack and other ice worldwide and continue to find growing evidence of the severity of climate change on our planet as evidenced by changes in ice such as the Ward Hunt ice shelf. March 2004 - The only tropical cyclone that reached hurricane intensity ever observed in the South Atlantic. The informally named Cyclone Catarina made landfall on March 28 in the town of Torres in Brazil. Wind speeds reached approximately 100 mph. Because Brazil had never experienced a weather event like this before, damage was severe. Fatalities were few, though, because authorities gave ample warning to citizens. 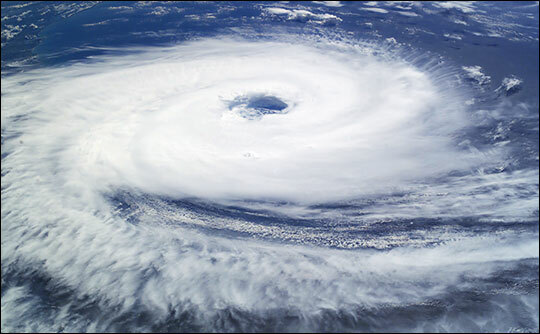 The formation of cyclones in the S. Atlantic is extremely rare. One of the conditions that contributed to the formation of Cyclone Catarina was the unusually warm sea temperatures--a condition that will become more likely in a warmer global climate. Now that the 2000's are finished and we're into the 2010's, we can take a look back at some of the major climate-change-related events of the first decade of the 21st century. Beginning on January 19, I started tweeting "The Climate decade in review" tweets several times a day. Check them out at www.twitter.com/steveoffutt. The Climate Decade in Review: August 12, 2003 - France records the highest temperature ever: 111 degrees Fahrenheit. This occurred during the 2003 European heat wave that killed as many as 35,000 people. Specific weather events like this are difficult to directly attribute to human-induced global warming, but most experts agree that climate change likely played at least a small role in the heat wave. Even if not, as global warming increases, the likelihood of devastating heat waves such as this one will continue to increase and they will become more common. As urban form is created, through development, redevelopment, zoning decisions, new buildings, and other changes made to the landscape, opportunities to allow for easier pedestrian travel are often missed. Sometimes they are deliberately blocked for seemingly irrational or no reasons. 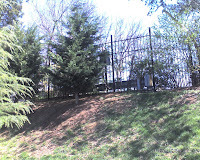 Often developments are built with fences on several sides without any thought of whether it might be good to encourage people to connect through the sides or backs of property. shows a location near Bailey's Crossroads almost right on the border between Arlington and Fairfax Counties. 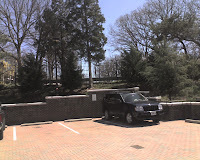 The end of Forest Drive almost touches the parking lot of the apartment building on Jefferson Street (although it's at a somewhat higher elevation). The building, instead of installing a staircase that would allow neighborhood people to easily walk from the neighborhood to the shops on Jefferson St., including the Giant Food and Starbucks, blocked it with a fence (see two photos). In the same way, the fence prevents residents of the apartment building from being able to walk around the neighborhood, say to walk their dog or just for enjoyment. I wonder: who is afraid of whom? Is that apartment building afraid of the neighborhood people? Well, the complex is wide open to Jefferson St.; anyone can just walk in from that side. Are people on one side dangerous and the others not? Or are the neighborhood people afraid that having a link here would allow undesirables into their neighborhood? I can partially see that point of view, although without this pedestrian option, getting to Starbucks requires driving out onto Route 7, which is a royal pain in the neck. Maybe it never occurs to them that they could conceivably walk there if it weren't for this fence. Just a couple of blocks away, there is a perfect example of just the opposite. It's noted on the above map. 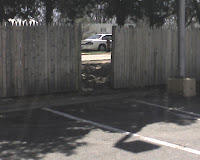 Here's a photo of a pedestrian pass-through built into the fence, allowing the apartment complex residents easy access to the nearby shops. This is a really good idea, which I think is probably strongly supported by both the shops and the residents. I've noted this missed opportunity out in Tysons Corner. Here a large office building abuts a set of shops, but not near the front, but along the side of the building and the back of the shops. This map shows where office workers have worn a path between their building and the shops, which is actually down a steep hill. It also shows how making the same trip via sidewalk (or car) is more than 1/2 mile. It's easy to see that both the office owners and the shop owners would benefit from having this link put in. The office workers would have easy access to more lunch options and services and the shops and restaurants would have a larger market. It's a no brainer, but I suspect no brains have given it any thought. There are certainly thousands of these small linkages that could be unblocked or created. Each one might open up pedestrian opportunities to a few people or a few score of people. But all multiplied together one could imagine literally thousands of short car trips being eliminated and quality of life for those people improved. Last year, the Washington Post published an article about speeding and red-light cameras (Shudder speed, Nov. 5). The article cited many cases of citizens hating the cameras, voting against them, vandalizing them and otherwise being significantly opposed. Personally, I'm fine with the cameras, since I do not speed or run red lights, which is, of course, the ultimate weapon to use against them. However, I do find myself in partial agreement with those who argue that the cameras are used to raise government revenues. At the end of the day, if everyone obeyed the rules, the cameras would collect no revenue, which is good and a laudable goal. However, until that day, the cameras are collecting fines. I believe that money could be strategically used to garner support for the use of the cameras themselves. The article stated that DC collected about $36 million in revenue for fiscal year '08 from camera fines. If half of that is actually needed to operate the cameras and administer the fines, etc., that leaves $18 million in other revenues. I actually have no idea of these numbers: I am making them up. I would think that once the system is established, that the administrative costs would be much lower than this, but I don't know. - Arguments about the cameras being primarily as revenue generators would become moot, since the city would not keep any revenues beyond the costs of administering the program. - Support, particularly among law abiders and non-car owners would strengthen. I know that if my household was going to get a check every year from fining criminal drivers, I would be very supportive. Warren Buffett and His Train Play: Good or Bad for Climate? 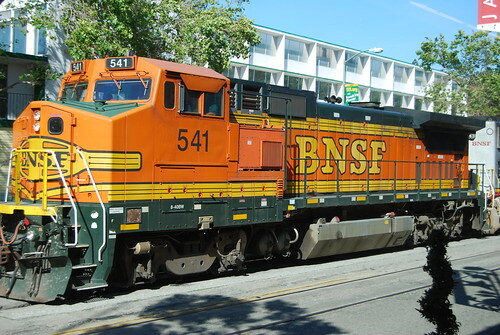 Back in November, Warren Buffett invested $26 or $34 or $44 billion to buy the Burlington Northern Santa Fe railroad (BNSF) (I saw several different values and didn't waste a lot of time trying to figure out which one was right). Last week Rolling Stone Magazine lampooned him for being a "Climate Killer." About a quarter to a half (again, conflicting figures) of BNSF's business is hauling coal, the antichrist of the climate change battle--300 million tons of it. Elena Schor at World Changing blog presents both sides. Green Energy Reporter reports on a couple of angles. So what do you think? Is Warren a "Climate Killer" by buying BNSF or is he supporting a lower carbon future by investing in greener transportation? A few weeks ago, the new trail connection from Harrison Street to the Custis Trail was completed (see post here). As you can see from this photo, there is a bollard installed at the end of the connector by the sidewalk on Harrison Street. 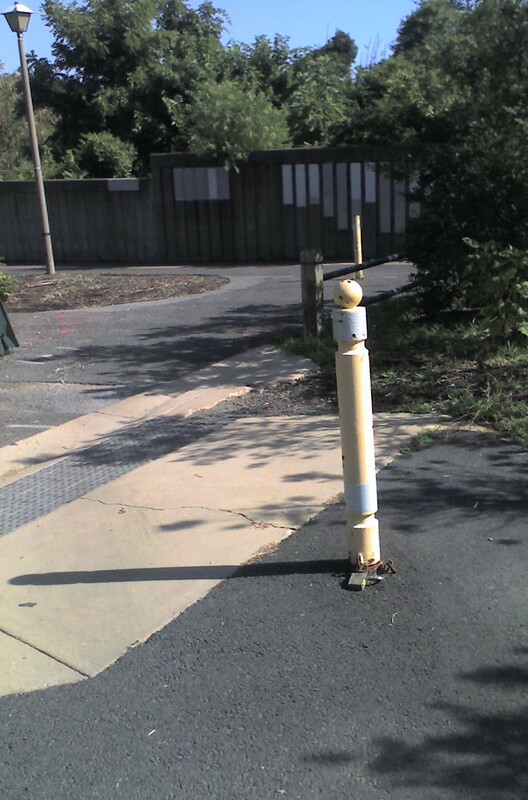 That got me thinking about bollards on trails. 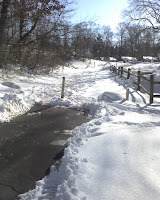 Having given it some thought, at least for the areas where I generally ride in DC and Northern Virginia areas, I think they are a waste of money and effort, serve no purpose and sometimes create a hazard. Note that this one has the post hole and base, which presents a hazard in and of itself. This bollard has been missing for years along this well traveled road, yet I have never noted any cars turning onto the path. Here's another. This one used to have a bollard, and one can see where it was removed and paved over to provide a smooth surface (although it's difficult to see in the photo, sorry). I have never encountered any cars trying to drive on this trail. Here's a W&OD crossing in Loudoun County. 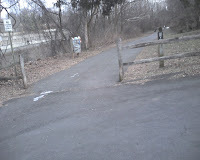 Note there is no bollard even though the trail is easily wide enough to accomodate a motor vehicle. 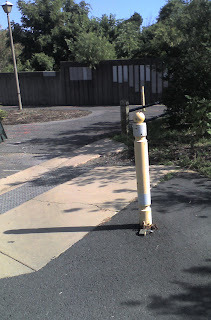 Here's a case where the bollard proved to be an impediment. The plow was unable to plow the final 30 yards to the sidewalk after the recent snow, because this bollard was in the way. I have saved the dumbest one for last. A few months ago, this new connection was built along the W&OD in Fairfax County near milepost 10. 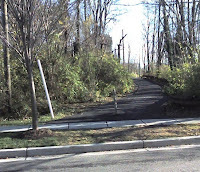 It connects the trail to a residential street called Malraux Drive (link to map here). There are bollards on both ends of the connector! And not small ones, either. Both of them are heavy steel construction that probably cost hundreds of dollars to install. 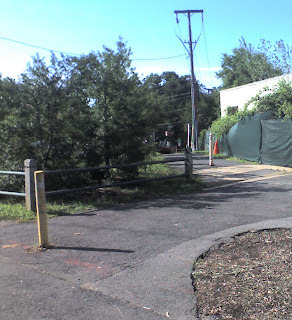 One could make an argument for the bollard at the other end, where the connector meets the street, but this one--at the connection of two trails--is senseless. In fact, it is worse than senseless: it's a hazard. I remember one day when I was pulling my daughter on the trailer bike, I got very nervous that I would smash her hand on the bollard as I negotiated this corner. I didn't thankfully. - They require maintenance, which is an additional cost. Or if not maintained, they break or eventually are removed and/or lost. - They can impede the movement of authorized vehicles, such as snow removal, maintenance or emergency vehicles. My recommendation would be that bollards not be included in future trail improvements. Should it turn out in the unlikely event that unauthorized vehicles become a problem, the bollard could be installed at a later date. There are three consecutive bollards in this photo along one short section of trail. This trail has since been modified, but there is still one bollard sitting in the middle of the trail at a point where there is no intersection of any kind. My daughter ran into this bollard, which is a bad design. 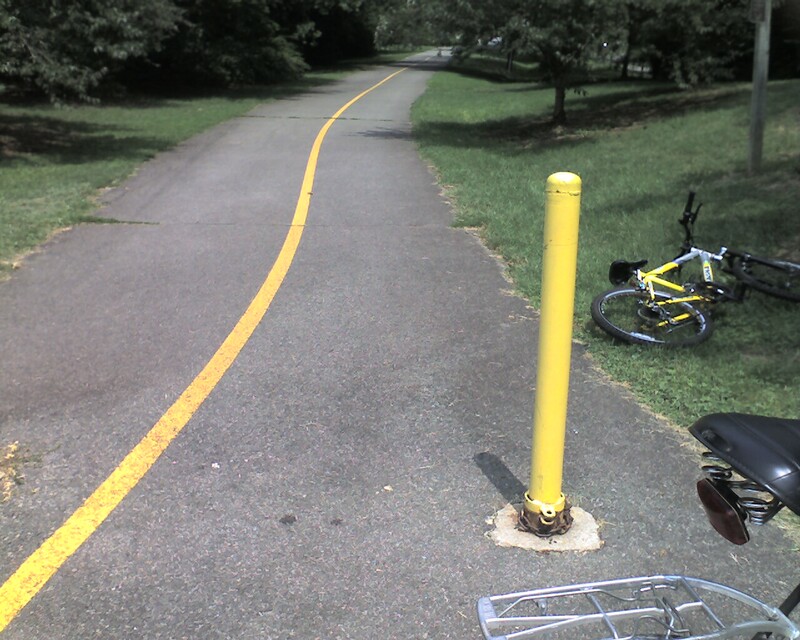 There are actually two bollards here, one on each side of the trail in the exact center of the lane of travel!!! Talk about a hazard.